HP just reported its fourth quarter earnings: inline with profits and a miss on revenue. HP reported Q4 earnings per share of $US1.06, right in line with expectations and revenue of $US28.40 billion, that’s a miss. Analysts expected $US1.06 earnings per share for the quarter and revenue to be $US28.77 billion, down 1.3% over the year-ago quarter. For the year, HP reported net revenue of $US111.5 billion, that’s another slight miss. Analysts expected the year to finish with $US111.74 billion in revenue, nearly flat (down only a .5% from last year). HP beat the non-GAAP full year EPS number by 1 cent. It reported $US3.74 when analysts expected $US3.73. The company had given guideance of $US3.70 to $US3.74 per share. This is the first earnings report since HP announced its plans to cleave itself into two public companies in 2015. Revenue was down in just about every business unit. The only bright spot was the PC division, where revenue was up 4% year over year with a 4.0% operating margin, entirely due to businesses finally buying new PCs. Consumer PC revenue was down 2%. GAAP operating margin 6.7% 6.6% 0.1 pts. 6.4% 6.4% 0 pts. Non-GAAP operating margin 9.6% 9.0% 0.6 pts. 8.8% 8.5% 0.3 pts. Information about HP’s use of non-GAAP financial information is provided under &quot;Use of non-GAAP financial information&quot; below. HP today announced financial results for fiscal 2014 and fourth quarter ended October 31, 2014. Fiscal 2014 net revenue of $US111.5 billion was down 1% from the prior-year period and flat on a constant currency basis. Fiscal 2014 GAAP diluted net earnings per share (EPS) was $US2.62, flat in comparison with the prior-year period amount and within the previously provided outlook of $US2.60 to $US2.64 per share. Fiscal 2014 non-GAAP diluted net EPS was $US3.74, up from $US3.56 in the prior-year period and within the previously provided outlook of $US3.70 to $US3.74 per share. Fiscal 2014 non-GAAP net earnings and non-GAAP diluted net EPS exclude after-tax costs of $US2.1 billion and $US1.12 per diluted share, respectively, related to restructuring charges, the amortization of intangible assets and acquisition-related charges. Fourth quarter net revenue of $US28.4 billion was down 2% from the prior-year period and down 3% on a constant currency basis. Fourth quarter diluted net GAAP EPS was $US0.70, down from $US0.73 in the prior-year period and within its previously provided outlook of $US0.67 to $US0.71 per share. Fourth quarter non-GAAP diluted net EPS was $US1.06, up from $US1.01 in the prior-year period and within its previously provided outlook of $US1.03 to $US1.07. Fourth quarter non-GAAP net earnings and non-GAAP diluted net EPS exclude after-tax costs of $US684 million and $US0.36 per diluted share, respectively, related to restructuring charges, the amortization of intangible assets and acquisition-related charges. For fiscal 2015, HP estimates non-GAAP diluted net EPS to be in the range of $US3.83 to $US4.03 and GAAP diluted net EPS to be in the range of $US3.23 to $US3.43. Fiscal 2015 non-GAAP diluted net EPS estimates exclude after-tax costs of approximately $US0.60 per share, related primarily to the amortization of intangible assets and restructuring charges. For the fiscal 2015 first quarter, HP estimates non-GAAP diluted net EPS to be in the range of $US0.89 to $US0.93 and GAAP diluted net EPS to be in the range of $US0.72 to $US0.76. Fiscal 2015 first quarter non-GAAP diluted net EPS estimates exclude after-tax costs of approximately $US0.17 per share, related primarily to the amortization of intangible assets and restructuring charges. The fiscal 2015 full year and first quarter outlooks do not include costs associated with the separation, which are expected to be non-GAAP adjustments beginning in Q1 2015. 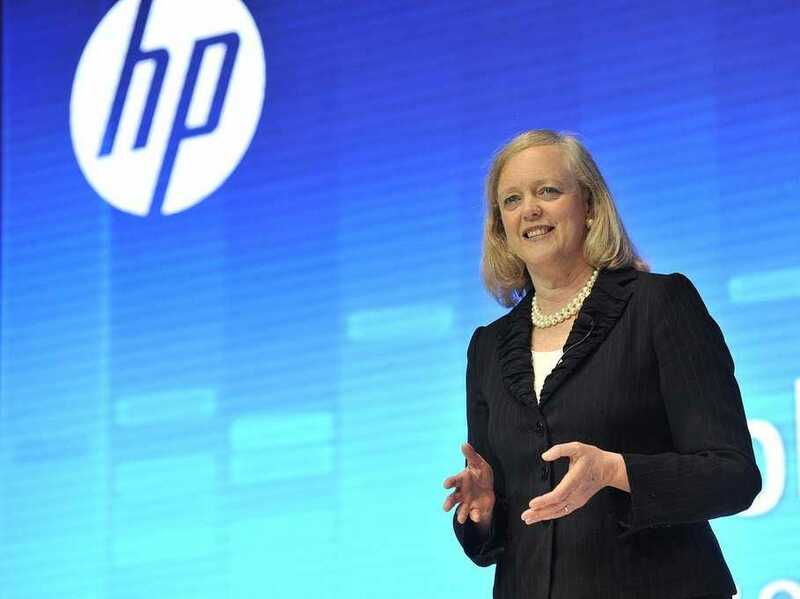 HP generated $US2.7 billion in cash flow from operations in the fourth quarter, down 4% from the prior-year period. Inventory ended the quarter at $US6.4 billion, up 3 days year over year to 27 days. Accounts receivable ended the quarter at $US13.8 billion, down 5 days year over year to 44 days. Accounts payable ended the quarter at $US15.9 billion, up 11 days year over year to 67 days. HP’s dividend payment of $US0.16 per share in the fourth quarter resulted in cash usage of $US309 million. HP also utilized $US750 million of cash during the quarter to repurchase approximately 21.7 million shares of common stock in the open market. HP exited the quarter with $US15.5 billion in gross cash. Personal Systemsrevenue was up 4% year over year with a 4.0% operating margin. Commercial revenue increased 7% and Consumer revenue decreased 2%. Total units were up 5% with Desktops units down 2% and Notebooks units up 8%. Printingrevenue was down 5% year over year with an 18.1% operating margin. Total hardware units were down 1% with Commercial hardware units up 5% and Consumer hardware units down 4%. Supplies revenue was down 7%. Enterprise Group (ETOLF)revenue was down 4% year over year with a 14.8% operating margin. Industry Standard Servers revenue was down 2%, Storage revenue was down 8%, Business Critical Systems revenue was down 29%, Networking revenue was up 2% and Technology Services revenue was down 3%. Enterprise Services revenue was down 7% year over year with a 6.8% operating margin. Application and Business Services revenue was down 6% and Infrastructure Technology Outsourcing revenue declined 7%. Software revenue was down 1% year over year with a 31.1% operating margin. Licence revenue was up 2%, support revenue was down 1%, professional services revenue was down 5% and software-as-a-service (SaaS) revenue was flat. HP Financial Services revenue was down 1% year over year with a 1% decrease in net portfolio assets and a 15% increase in financing volume. The business delivered an operating margin of 12.1%.